Mobikes near Farragut Square. Image by Brian Barrie used with permission. Dockless bikeshare has come to DC. On Wednesday morning, Mobike opened service to the public. At least two other companies, LimeBike and Spin, are not far behind. How's it working so far? I took a ride to the office to try it. After downloading the app, I had to enter my phone number, get a code, and then "top up" my account with a credit card. Rides cost $1 for a 30-minute ride; all of the systems poised to launch seem to be planning the same pricing structure. The app was pretty simple, a little more austere in its wording (perhaps because it hasn't been live in the United States until today). My Wi-Fi has been finicky, and the app seemed to freeze some when the Wi-Fi was giving problems; it was smooth once I turned off Wi-Fi. But it was all self-explanatory and straightforward. There were a lot of Mobike bikes available in my neighborhood of Dupont Circle. Presumably, Mobike itself put most of them there, since they were in clusters around bike racks. There was a solitary one even closer, just a block away on P Street. I used the "reservation" function to make sure nobody else could take it (you can reserve a bike for 15 minutes), then walked over. The blue dot is where the bike actually was. Image by the author. As I got to the pin on the map, I didn't see the bike. Oh, no—did someone keep the bike inside their house or something? Wait, there it is across the street from the pin where I couldn't see it at first because of the parked cars. GPS isn't more precise than about 16 feet, and so I did notice a few cases where the bike pins seem to be just a little north of where the bikes actually are. So a bike on the south side of the street appears to be on the north side. I didn't try it, but it looks like if you can't find the bike you can click "Ring" and it'll make a sound. Once I found the bike, it was a snap to scan the QR code, the bike unlocked, and I was on my way. The bike seems pretty smooth and well built. (And, it's brand new!) It's heavier than most personal bikes but lighter than the CaBi bikes, which is nice as long as the bikes hold up to abuse over time or the company is prepared to replace them more often. It has 3 speeds, like a CaBi bike. The bell is in the grip, just like the twist-style gearshift but on the opposite side. There's a basket which also doubles as solar power when there's nothing in the basket. The app shows a red perimeter around all of DC but with the Mall and nearby federal lands (the White House complex, Capitol, West and East Potomac Park, etc.) outside the line, suggesting bikes can't be parked there. However, I was able to lock the bike inside the White House area. So I'd suggest they work on code so that it'll refuse to lock in inappropriate areas like this. Left: The perimeter excluding federal lands. Right: I was able to lock the bike here, inside the perimeter. Image by the author. There's not going to be a way to stop bikes form being locked on, say, small federal triangle parks, because of the aforementioned GPS inaccuracy. (This isn't a Mobike-specific thing; it's just the way GPS is). But, the central federal park area is big enough that it can know if you're inside that area by more than a few meters). I rode over to my office, found an empty spot on the sidewalk, and locked up. You lock the bike not by using the app (I was confused about that at first), but by manually pulling a lever on the locking mechanism, which then makes the bike beep and your app will update to reflect the trip is over. Whether Mobike put them there or others rode them, there are a lot of bikes in this part of downtown DC, according to the map. But it certainly doesn't look like the streets are all crowded with bikes everywhere or anything. Bike systems are limited to 400 bikes per the DDOT permit, so even with 4 systems there would be about 1,600 bikes—much fewer than the 2,500 CaBi bikes based in DC. (The system has almost 4,000 bikes, but spread around more jurisdictions). Mobike seemed easy to use and very convenient. I was able to get a bike closer than the nearest CaBi station, and then park it right in front of my office building. Of course, I live in Dupont and our office is downtown. Right now, the app doesn't show any bikes east of the Anacostia, or in the ballpark area, or LeDroit Park, or Columbia Heights, or Cleveland Park, or Brookland, or even Adams Morgan. They're all in the central area. That's okay for a launch, but it'll be interesting and important to see if they end up spreading out. As we identified in the DCST recommendations, DC has spent money in both capital (to place stations) and operating (to rebalance bikes there) in many lower-density, more distant areas. Maybe dockless bikeshare will ultimately serve all of those needs. I certainly am not judging Mobike based on where the bikes are after they've been launched for a mere few hours. Or, maybe dockless bikeshare will mainly center on the core of the city, and CaBi will serve the outer areas better. If the latter, we just need to ensure that dockless doesn't take the high-value riders away from CaBi, hurting its budget, without a corresponding payment. That's why DCST has recommended, first, that dockless bikeshare companies have to publicly share a lot of usage data, and second, a system of "in-lieu fees" where companies can either serve a broad area, or pay into a fund so CaBi can serve it instead. I'll let one DCST member staff comment sum up the conclusion, which I share: "I think it has a role in the biking landscape, and while there will be some growing pains, it's probably a good thing." LimeBike and Spin have announced plans to launch imminently as well. (Perhaps by the time you read this, they will be operating)! 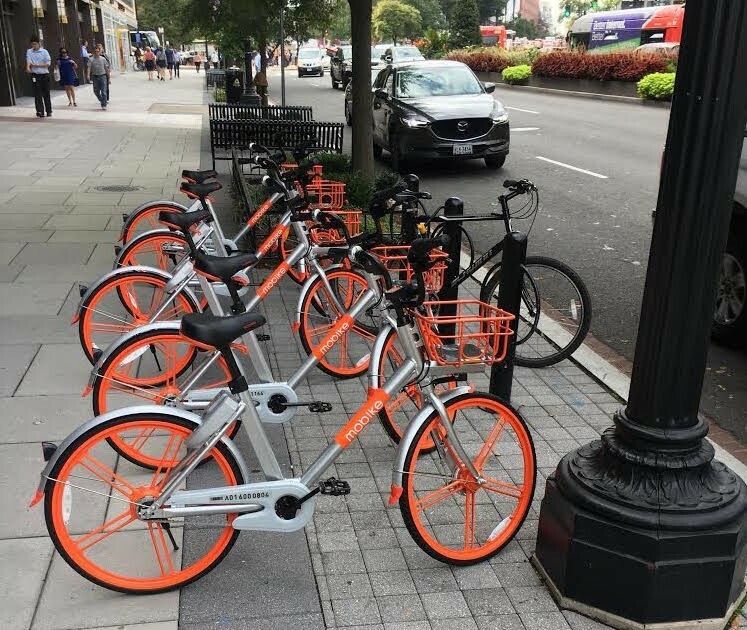 Have you tried Mobike or another service in DC? What did you think?